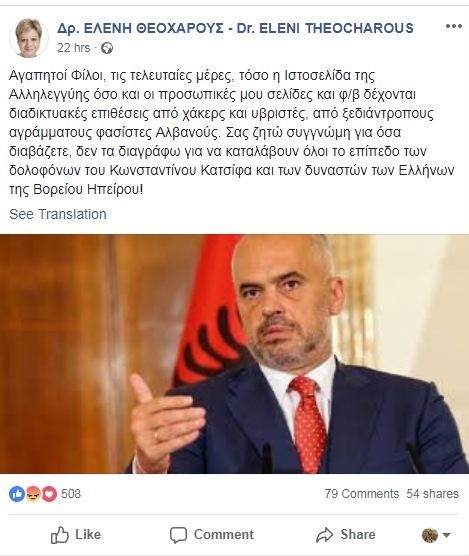 The Cypriot MEP Eleni Theocharous, who was declared "non grata" by Albanian Authorities after her anti-Albanian declarations on the day of the burial of the Greek minority in Albania Kostandinos Kacifas made today another anti-Albanian statement. She has accused that Albanian hackers of having attacked her sites on the Internet. Through a post on Facebook, Theocharous says the "illiterate crowds of fascist Albanians" have been attacked on their online sites. Dear friends, in the last days, as my solidarity page, my personal and FB sites have taken online attacks by hackers, the illiterate crowd of fascist Albanians. I apologize for what you read, I do not erase this, in order that everyone understands the level of the assassins of Kostandinos Kacifas and the oppressors of the Greeks of Northern Epirus! We remind that after being declared "non grata", Theocharous considered this an "honorary title" of the Albanian authorities for her.